Rudger may be imaginary but his friendship with Amanda Shuffleup is entirely real. That she first meets him in a cupboard is irrelevant. That her mum can’t see or hear him doesn’t mean he isn’t there. Together Amanda and Rudger get up to all the things normal friends get up to, like fending off aliens in the back garden or exploring a cavern under the stairs. But then Mr Bunting starts sniffing around. Despite appearing middle aged, Mr Bunting still has an imaginary friend. He can see everyone else’s too. Which is handy for him, seeing as he eats them. Or, more accurately, drinks them. He’s not really middle aged, of course. Like a demonic Dorian Gray, Mr Bunting has been prolonging his life by lapping up the fruits of the imaginations of children for a century. Amanda knows she has to keep away from Mr Bunting so that he doesn’t swallow Rudger too, but when fleeing from his clutches she ends up running in front of a car and being knocked into a coma. This is the story of what Rudger does next, alone, and with nobody to believe in him. A F Harrold’s Fizzlebert Stump (The Boy Who Ran Away from the Circus (And Joined the Library)) was like a slightly zanier Roald Dahl. The Imaginary is zanier still, especially when Rudger finds out what other lonely imaginary friends get up to when they’re left on their own. However, the story remains rooted in a real, believable world visited by darkness and tinged by sadness but which is made all the nicer to live in thanks to the imaginations of its inhabitants. It also has a perfect ending, for reasons I couldn’t explain without spoiling it. So I won’t do either. 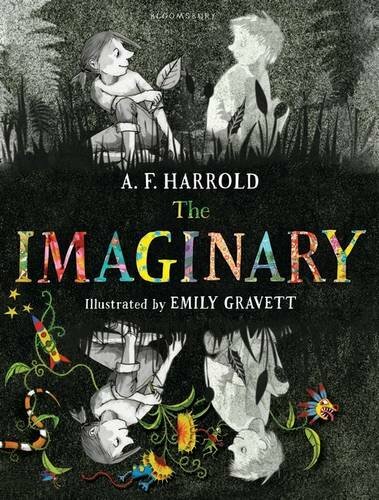 The grown-up in me can see this is a book about the power of imagination, the importance of libraries, and about how growing up invariably involves saying a few final goodbyes (even if you don’t realise they were the last ones until afterwards). But at the same time the little boy in me can see this book as a vindication – Jimmy really did exist, and he really did live somewhere near Grandma (and whilst Jimmy’s best friend Ponk probably was imaginary, he was obviously a product of Jimmy’s imagination rather than mine).